Everyone is entitled to free advice when subject to a police interview. Solicitors need to apply for Legal Aid via the LAA portal. In order to do this all clients need to sign an e14 declaration and provide some basic financial information. Once the firm have the signed form and the basic information they can apply for Legal Aid. 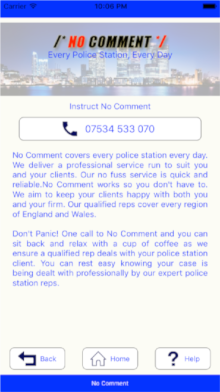 The No Comment app simplifies the process for both the firms and the police station reps. Clients provide a signature directly on your mobile device. That signature is used to create a signed e14 which is sent immediately to the firm. This means that there is no delay in applying for Legal Aid. The client signs prior to interview and the firm get the Legal Aid application done before the client has even left the police station! Welcome to the No Comment app. 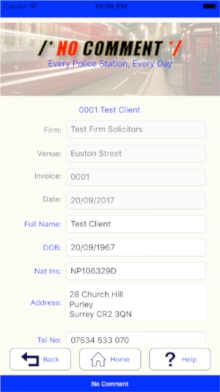 Say goodbye to paper legal aid forms. Simply login and find your No Comment clients. 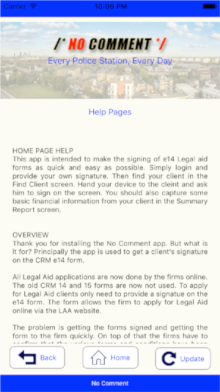 The app will capture the clients signature and deliver a signed 314 Legal Aid application to the firm. 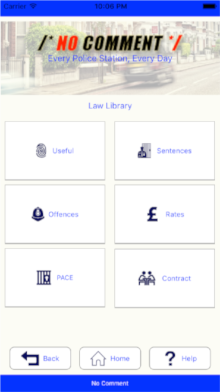 You can also complete reports and even find police station telephone numbers. 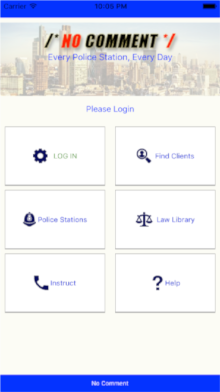 The app puts a host of legal information at the finger tips of the busy police station rep. The No Comment app is only available at present for use with clients who came via instructions from No Comment. If you have been instructed by No Comment then you will have a login and password for this site. When you are first instructed an account is created for you and an email was sent with your details. If you have lost your login details feel free to contact us at any time. 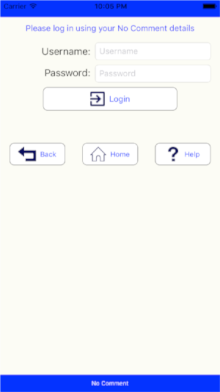 The login details you use for the site and the app are the same. On this screen you capture your signature and the clients signature directly onto your device. Its very simple, just use your stylus or even your finger to make your mark on the screen. But do remember to hit save. Your No Comment clients will appear in the list of clients. If one is missing just hit refresh. The list syncs with our database. All you have to do is click on the clients name. 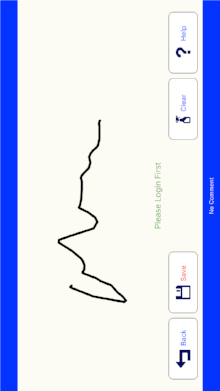 The main purpose of the app is to capture the clients signature. You should do that for all clients. But you can also grab the basic client financial information via the report screen. 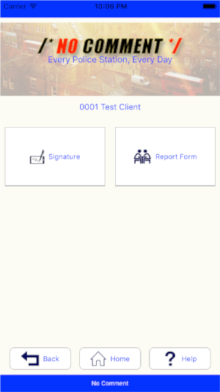 Use the report screen to capture some basic information about the client. The information is used by the firm to apply for legal aid. 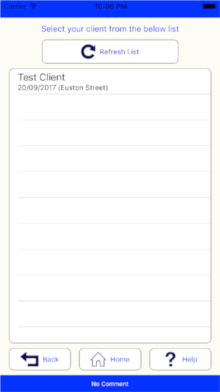 The No Comment app stores the address and phone numbers for all the police stations, courts and prisons in England and Wales. Simply enter the name of any venue and pick the station from the list. 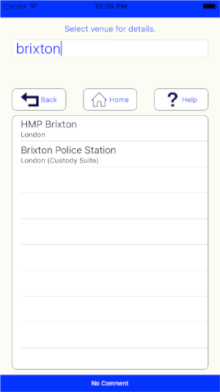 Information about every police station, court and prison in England and Wales is contained in the app. 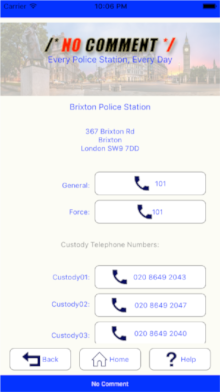 The custody suite phone numbers are also listed. Simply click on the buttons to make the call. No Comment is open all day every day and covers all the police stations in England and Wales. You can contact us at any time with any queries, suggestions or problems you may have. At the bottom of every page is a button that allows you to seek help as you go through the app. But feel free to contact us at any time if you need help. We are all busy and learning any new system will always have a learning curve. • I represented the applicant. I acted as a representative of the instructing solicitor who instructed me via No Comment Legal Services Ltd.
• I confirm that I am authorised to provide representation under a contract issued to the instructing solicitors firm by the LAA. • I confirm that I have gone through the questions on the Interests of Justice and financial assessment aspects of the application with the applicant. • I confirm that the applicant has not provided me with any information which contradicts the information provided in this declaration of financial circumstances and has given me no indication that information declared is incomplete or untrue. i. I may be prosecuted for fraud. I understand that if I am convicted I may be sent to prison or pay a fine. ii. My legal aid may be stopped and I may be asked to pay back my costs in full to the Legal Aid Agency. iii. If my case is in the Crown Court the Legal Aid Agency may change the amount of the contribution which I must pay. • I agree to tell the LAA or HM Courts & Tribunals Service (HMCTS) immediately if my income or capital or those of my partner, change. These changes include the sale of property, change of address, change in employment and change in capital. • Evidence: I agree to provide, when asked, further details and evidence of my finances and those of my partner,to the LAA, its agents, or HMCTS, to help them decide whether an Order should be made and its terms. • Ending Legal Aid I understand that I must tell my solicitor and write to the court if I no longer want public representation. I understand that if I decline representation I may be liable for costs incurred to the date when my solicitor and the court receive my letter. • I authorise such enquiries as are considered necessary to enable the LAA, its agents, HMCTS, or my solicitor to find out my income and capital, and those of my partner. This includes my consent for parties such as my bank, building society, the Department for Work and Pensions, the Driver and Vehicle Licensing Agency or HM Revenue and Customs to provide information to assist the LAA, its agents or HMCTS with their enquiries. • I consent to the LAA or my solicitor contacting my partner for information and evidence about my partners means. This includes circumstances where my partner is unable to sign or complete the form. • I understand that if the information which my partner provides is incorrect, or if my partner refuses to provide information, then: if my case is in the magistrates' court, my legal aid may be withdrawn or, if my case is in the Crown Court, I may be liable to sanctions. I understand that the sanctions may result in me paying, or paying more towards my legal costs, or paying my legal aid costs in full. • I understand that in Crown Court proceedings the information I have given in this form will be used to determine whether I am eligible for legal aid and, if so, whether I am liable to contribute to the costs of my defence under an Income contribution Order during my case or, if I am convicted, under a Final Contribution Order at the end of my case, or both. • I understand that if I am ordered to pay towards my legal aid under an Income Contribution Order, or if I am convicted and ordered to pay under a Final Contribution Order but fail to pay as the Order instructs me, interest may be charged or enforcement proceedings may be brought against me or both. • I understand that I may have to pay the costs of the enforcement proceedings in addition to the payments required under the Contribution Order, and the enforcement proceedings could result in a charge being placed on my home. • I have read the Declaration and Fraud Notice above.